TOP LEFT: Art deco dog is a steel stamping mounted on top of the worm. Yellow celluloid sheath protects the worm when threaded in place. UPPER MIDDLE: Those yokes Dutch girls use for carrying pails prove here to be excellent handles for corkscrews. She's cute, she's heavy and she's bronze. RIGHT OF MIDDLE: A silver fox. This is one of the few treasures I took home from the Christie's May 6 auction of our dear friend Gianni's collection. Christie's auction catalog described it as a mouse. A mouse in Connecticut does not normally disguise himself as a fox. 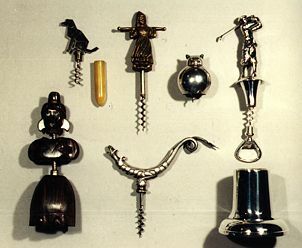 LOWER LEFT: She's a Perille corkscrew and she has been perfectly fitted with head, upper body and skirt. Each of the three carved rosewood pieces is secured with a wood pin. The head is secured to the handle at the top (you can see part of the handle - her earrings), the upper body to the fly nut which has been trimmed to accommodate it, and the skirt to the frame. The bottom of the skirt is marked "Made in France." LOWER MIDDLE: My dragon came to me a couple of years ago in a fitted coffinlike case marked "L.M." (for Lucky Me!). Inside the case is marked Jn Bte Blanc de Juge Fabricant, Marseilles. Thanks to Edith Olive, I know this company was in business from 1900 to 1918 at 16 de la rue Longue-des-Capucins in Marseilles. LEFT HAND SIDE: In his 1990 Best Six, Elide Albert posed the question about his golfer possibly being the top of a trophy. Here is the golfer complete with stand. My trophy is marked "E10." Elide's has Z25 and Z26 for marks.